Violinist Erica Ward has two decades of teaching and administrative experience as a private teacher, school clinician, youth orchestra and chamber ensemble coach, and concert producer. She served as a mentor and coach in the Cleveland Institute of Music Summer Chamber Music Camp, San Francisco Public Schools String Program, and as an Apprentice of Teaching in the San Francisco Conservatory Preparatory Division. Additionally, Ms. Ward has served as Administrative Intern for the San Jose Youth Chamber Orchestra and violinist and member of the Board of Directors for the Cleveland-based contemporary ensemble FiveOne Music. Active in her performing career, Ms. Ward has a special passion for the works of Beethoven and has performed the Complete Beethoven Sonatas for Piano and Violin twice with Hong Kong-based pianist Karl Lo. 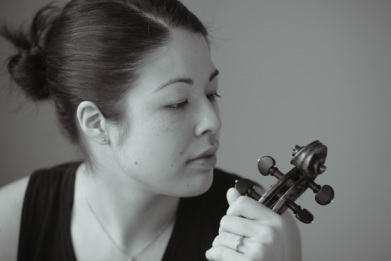 She has collaborated, among others, with the Degas Quartet, Luna Nova Quartet, Annie Fullard, Desmond Hoebig, Lynne Ramsey, Mack McCray, and Cary Lewis, and has studied chamber music with Mark Sokol and Ian Swensen, Peter Salaff of the Cleveland Quartet, and the Cavani, Tokyo, Avalon, Ying, and Maia String Quartets. As a guest of the Degas Quartet, Ms. Ward served as Artist in Residence at Appalachian State University and Guest Lecturer at Western Kentucky University. Ms. Ward has performed with the Berkeley Symphony Orchestra, San Jose Chamber Orchestra, Erie Philharmonic, Stockton Symphony Orchestra, Modesto Symphony, and the Russian Chamber Orchestra, as Concertmaster of the Suburban Symphony Orchestra in Cleveland, OH. Summer festivals include the Icicle Creek Chamber Music Institute and the Zephyr International Chamber Music Festival in Italy. A native of Portland, Oregon, Ms. Ward received her BM from the San Francisco Conservatory of Music, and her MM from the Cleveland Institute of Music, where her principal teachers were Camilla Wicks, Wei He, and Paul Kantor. Ms. Ward resides in Alameda with her husband, two young daughters, and fluffy white dog, Ollie.